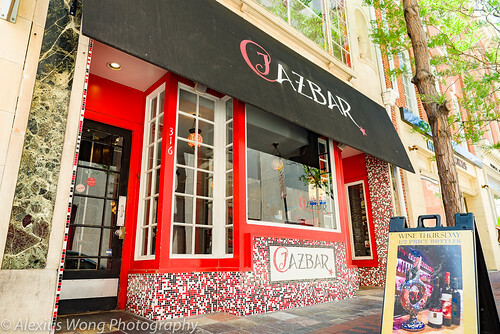 In my last blog, I reviewed an Uyghur restaurant in Northern Virginia where I found its cuisine alluring and rather exotic. However, it is temporarily closed due to its building is for sale while the eatery looks for a new location. Coincidently, I got wind of another Uyghur and Turkish restaurant closer to me, in Hyattsville. Marco and Polo Restaurant is located in the fairly new University Town Center, to the side of the huge library. Walking into the space, its dining room is rather spacious that leads to a colorful performance platform. As I got a good view of the open kitchen, I perused the menu with my sight on many dishes listed. For starters, I was curious about the Chuchura Soup that the amiable owner touted about. It was only on my third trip that I managed to get a taste of it. 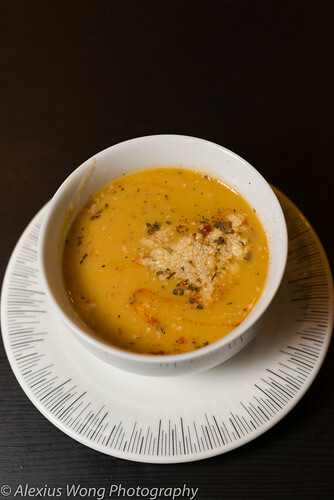 And my goodness – what a soup! The broth was weighty and well-seasoned with a meaty flavor that belied its nearly clear broth, yet devoid of extraneous flavors usually associated with lamb. 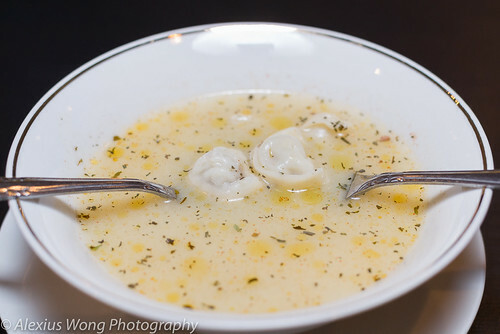 The equal partner was the small dumplings that were characterized by a silky smooth and tender dough encapsulating a mild and tasty soft meaty filling that made me return for more. 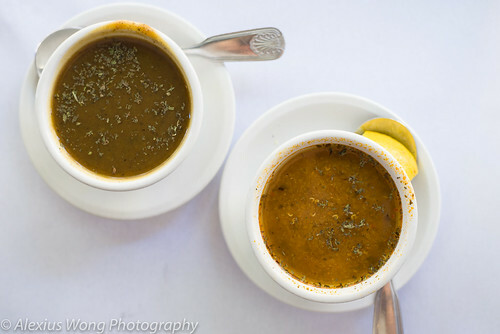 The hint of herbaciousness from the dried mint added a slight note of exotica to this already beguiling soup that pointed towards skill, love, and pride, qualities that would definitely make this a must-order. On another trip, an order of lentil soup proved to be interesting. The dried-bean soup was velvety smooth, punctuated by some chili heat, dried mint, and enriched by a sprinkle of parmesan cheese. However, for me, it lacked a lemon wedge that would have lifted the sip a bit more. 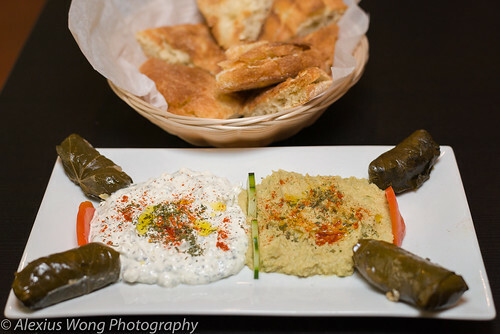 On one visit, we ordered the Mixed Meze Platter. What arrived was an array of stuffed grape leaves, hummus, and tsatsiki. The grape leaves were properly made and seasoned with its mild vinegary note with a fully-cooked rice filling, the hummus smooth that reminded me of what I have tasted in Istanbul (but not quite as punchy as the Lebanese version), and the tsatskiki that was creamy, tangy and filled with bits of feta-like cheese that added a brininess that made it quite exciting. The bread was the ideal canvas to these dips with its crusty outer but pillowy and warm inside, exuding hint of yeast and sweetness, making it carb-worthy. An order of Samsa was also made on that visit. The baked dough was stuffed with a lamb filling that was meaty, not too “lamby”, and fragrant from some onion. But I wished that the they were not baked so long as some parts of the dough became rather stiff – I’m sure this was a simple oversight that could be easily rectified. 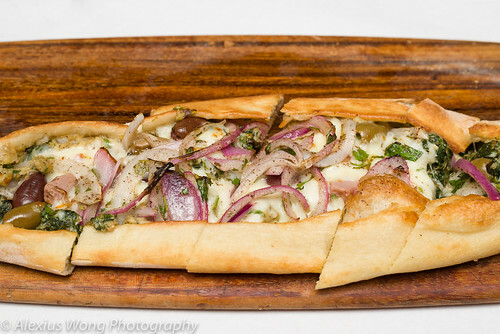 From the bakery section, one visit’s order was Sdwuck Pide. 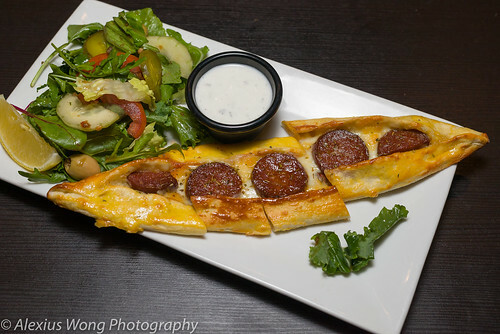 The boat-shaped pizza arrived with large pieces of Turkish sausage that was quite spicy, meaty, balanced with a tangy note. The dusting of oregano on top (organic according to the chef) was the perfect foil to this rich yet light bite, and the dough was perfectly baked with a crustiness over a bouncy inside, making it a perfect lunch bite with the side salad that was slightly punchy from olives and pickles. Another baked dish was Borek which consisted of crispy dough wrapped around a stuffing of a creamy cheese mixed with a stringy one, mixed with some parsley. It was quite tasty with a tangy tone in the cheese mixture. 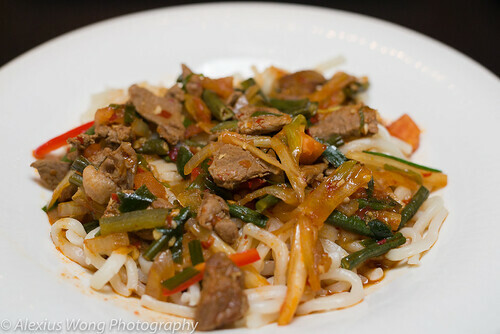 Uyghur cuisine is known for its noodle dishes, and I had to try a couple of them. Home Style Leghmen consisted of pieces of meat (the beef in this order was quite tender), and a plethora of Chinese long bean, celery, green onions, and red peppers that added their individual character to each bite. The sauce was quite savory with a hint of spice heat and a tinge of vinegar to balance the profile. The noodles was the hand-pulled kind (witnessed from the dining room) that were unfortunately slightly overcooked since I prefer it more al dente, but it did not deter me from liking the dish. The other noodle dish was Liang Mian. 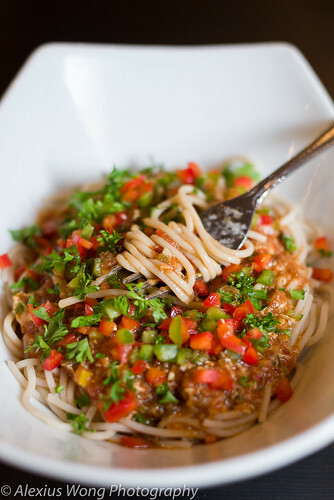 The noodles were cooked perfectly al dente (organic gluten-free noodles, shown to me by the chef), mixed with a combination of a chilled cooked sauce and amazingly finely-chopped parsley, and red and green peppers as its topping. The flavors were a mixture of vegetable flavors, a rather strident vinegar note that was not too overpowering, and some chili heat that produced a gestalt effect that beckoned me over and over again. This is a perfect summer cold dish, even though I was thoroughly enjoying it mid-winter. Uyghur Polo was one of the meat dishes that I tasted. Pieces of lamb was cooked tender, tasting mild, and devoid of the extraneous flavors, sitting above medium-grain rice that was perfectly cooked and tasting savory, studded with soft pieces of carrot exuding some sweetness left over after being cooked in the broth. It reminded me of the Afghan meat-rice dish, but this was more savory without the cloying carrot-sweetness in the latter version. The other meat dish was Chicken Kebab. The chunks of chicken breast were well-seasoned through and through with a little bit of spice heat, smokey from grilling over coals, but maybe a bit dry from some folks since super moist breast is an American obsession. The side rice was the basmati kind that was savory but a tad dry, accompanied by the grilled vegetables and the wonderful salad. Judging by these dishes, grilled meats are definitely a strong suit in this house. At the end of one of my visits, the chef ingratiated us with a serving of Döner Kebab. I was quite full from the meal, and I was not sure if I was up to it. But one bite of it was revelatory. The meat exuded some dark spices yet tasting mild for this type of gyro preparation. Each piece had a slight crispiness from the rotisserie spit roast, holding on to moist meat, which made this dish appealing enough as an order in the future. On another visit, a neighbor’s dish was so visually appealing that I couldn’t help staring at them and eventually asking them their opinion of that dish. 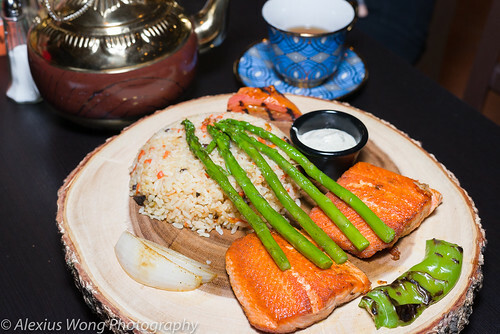 The pieces of salmon, rice and asparagus spears were served on a piece of tree trunk that enhanced the visual. The ladies noted that the fish was crispy on the exterior yet moist inside, the vegetable perfectly cooked without being mushy, and the rice savory studded with carrots and small dark raisins. Judging from the women’s effusive reaction of the dish, I wouldn’t pass it over on future visits. The array of desserts looked appealing sitting in the display counter next to the kitchen. 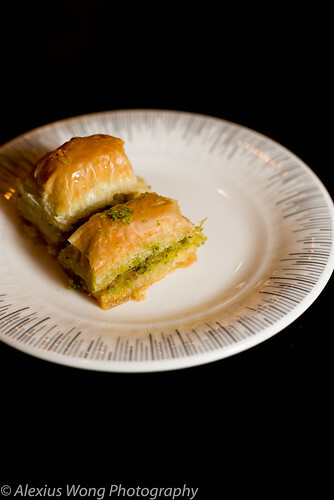 One of the duo Baklavas was the pistachio kind. It was quite buttery, not cloyingly sweet, exuding honey notes and hints of the pistachio nut. Its partner was the walnut kind. This bite was more buttery and crispier in the layers of phyllo, with a mild astringency from the use of roasted black walnuts that was the perfect foil to the honey-based syrup. Although they were not as floral as the Lebanese ones that I am used to, these bites were well-made, and I appreciated its subtleties in each mouthful. I’m looking forward to trying the other desserts, including the rice pudding that was amiss on my few visits. What I discovered at Marco and Polo Restaurant mostly impressed me with the interesting dishes that reflected skillful cooking, a caring hand, and lots of heart. These qualities were evident in many dishes, from that amazing dumpling soup, the cheesy and tangy tsatsiki, the yeasty and crusty bread, the well-baked Turkish sausage pide, the full-flavored and brow-raising noodles, the well-seasoned and quality meats in the rice dishes and grilled dishes, the impressive-looking salmon dish, and finally the understated but charming desserts. Having spoken to the chef-owner during each visit, one senses his knowledge married with his soul inbued in his proud wonderful offerings. With such cooking and care, I will certainly be making many more trips to this newfound establishment. Recently I blogged about a Korean restaurant which I enjoyed their savory offerings, but only after having complained about how hard it was finding one that was worth raving about. The same sentiment can be applied to Middle Eastern restaurants. I guess this can be attributed to me being spoiled by my visits to the many exemplary establishments in Detroit, where my brother used to live, with a plethora of such eateries, and hence the competition for excellent fare. The other reason could be pointed to my invitations to a Lebanese-Armenian friend’s house for his mother’s divine dishes. But recently, I came across a newfound restaurant serving such cuisine that is worth mentioning. 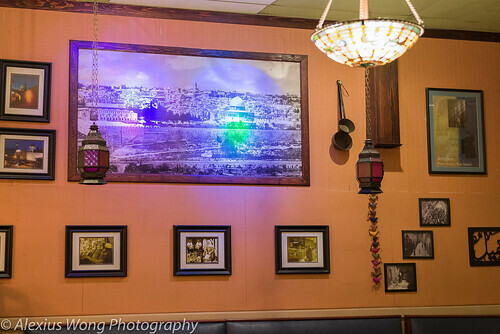 Jerusalem Restaurant is located in Bailey’s Crossroads, Fairfax, VA, quite off my beaten path of restaurant hunting. But an online coupon perked my interest in this establishment since Middle Eastern cuisine is scant on my blog site. Located off the busy Route 7, it is quite a spacious place sitting in the middle of a strip mall. Walking into it, you sense the rather exotic decor immediately by the art and the furniture. After greeting my dining companion, we quickly corralled a number of dishes to be savored and written about. 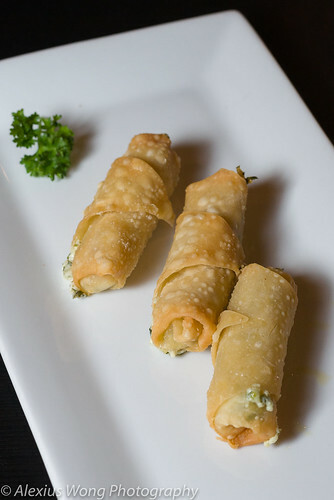 The appetizers are divided into the cold and hot sections. From the former, we honed in on a couple. The first was Trio Platter. The beautiful square plate arrived with Hummus, Babaghanouj, Labneh, and complementary, yet de rigueur in such establishments, olives and pickled radish. 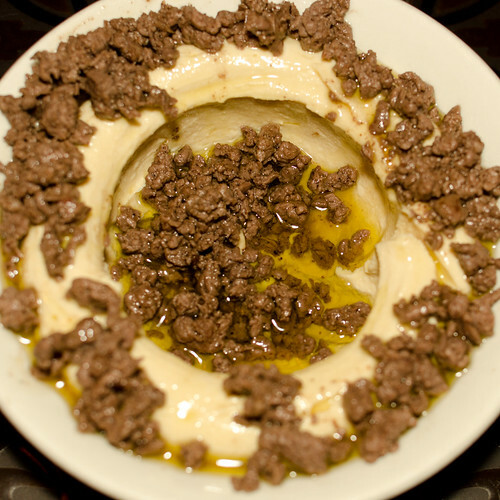 The Hummus was smooth, creamy and tangy, all the necessary notes for it to be successful. The Babaghanouj exuded the necessary smokiness as a counterpoint to the luxurious silky roasted eggplant, with a tinge of garlic. The Labneh was thick and creamy, much like Greek yogurt, tasting tangy and fruity from a drizzle of olive oil. The complementary olives and radish were tasting rather fresh and house-made, beckoning us to nibble on them throughout dinner. The pita bread tasted fresh and which was the perfect vehicle to transport the various dips to mouth, albeit a bit thicker than the Lebanese kind, which I prefer. The second order caught my attention immediately upon seeing it on the menu. 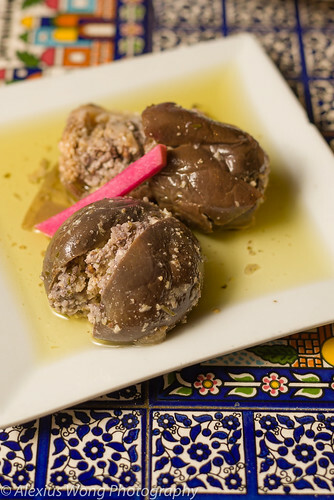 Makdous is dish of small green eggplants stuffed with a filling of crushed walnuts, red pepper, garlic, and marinated in olive oil. The vegetables were cooked through without falling apart encasing a stuffing that was enticing and quite exotic, being nutty, extremely garlicky, and all brought together by a long marination in olive oil. As starters, my friend and I thoroughly enjoyed these openers. 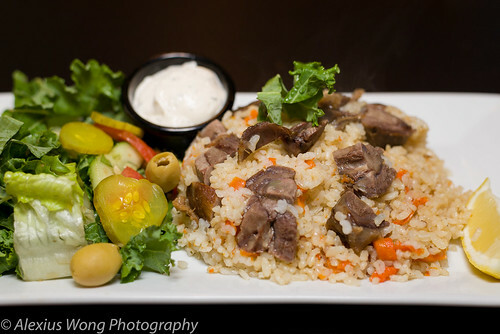 My friend’s entrée order was quite standard fare for Middle Eastern cuisine – Chicken Couscous. The bowl arrived with the grain mixed with vegetables, topped by pieces from half a chicken. The couscous was a departure from the Moroccan style that I was used to, being a bit stodgy and tangy due to the use of tomato as its stock base. The companions of squash, carrot, chickpeas, and potato were the usual. However, the squash and carrot were slightly undercooked (the only time I prefer my vegetables thoroughly cooked). But it was the chicken that was getting my undivided attention. The pieces were moist and thoroughly cooked encased by a smoky and crispy skin, which made them very irresistible, albeit a bit under seasoned. The waitress explained that the chicken was slow cooked for an hour, then finished on a grill resulting in that wonderful crispy skin. Even though the couscous didn’t make an impression, the tasty chicken was sumptuous enough to make up for the deficiencies. My order was another discovery just like the eggplant appetizer. 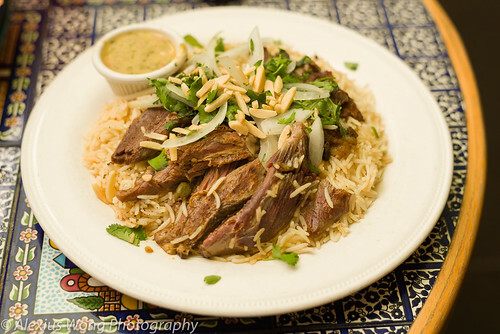 Hannet is made with lamb and rice, and one bite into the dish got me hooked. The lamb tasted properly seasoned and was fall-off-the-bone tender while exuding its characteristic meaty flavor without being over whelming. Obviously it was boiled in a stock until its proper doneness. The accompanying rice was no shy partner in this dish. The Basmati rice was light and fluffy, tasting extremely savory from the use of stock, and wonderfully aromatic from the use of green cardamom pods (more subtle than the dark ones). The combination of rice and lamb in each forkful was a harmonious marriage, made more tantalizing by the slivers of nutty almond and slices of pungent raw onion. The side of sauce was fiery, pungent from garlic and onion, and lemony, all elements to elevate the dish even further. This dish was indeed an eye opener and a success for me. Even though we were very sated from the various courses, we were tempted throughout the meal by the dessert display sitting under some bright lights a few feet from us. It was quite difficult choosing from the rather large array of sweets, some of which I recognized and savored before. Eventually, we chose Warbat. It is pretty much fillo dough encasing a custard, and soaked in syrup. I must say I wasn’t too impressed with this one for its slightly cloying sweetness which begged for an orange-blossom water note, and the custard was not rich enough to elevate it beyond pedestrian. Maybe another choice from the many would have been more successful. I’m glad I trekked a distance to try out this restaurant. 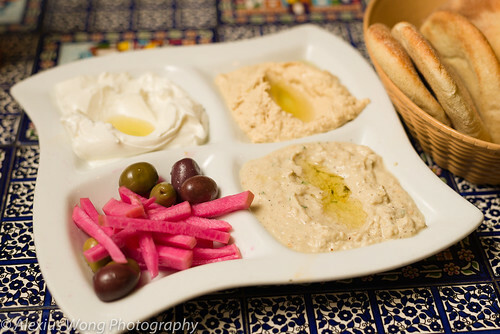 The meal openers were successful in my mind, with the properly made hummus, labneh, and babaghanouj dips, to the stuffed marinated eggplant that was exotic to spark some curiosity in us for the rest of the meal. 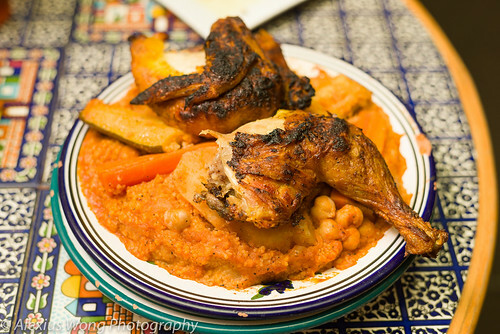 The chicken in the couscous dish really hit the spot with its smoky crispy skin and fairly moist flesh. 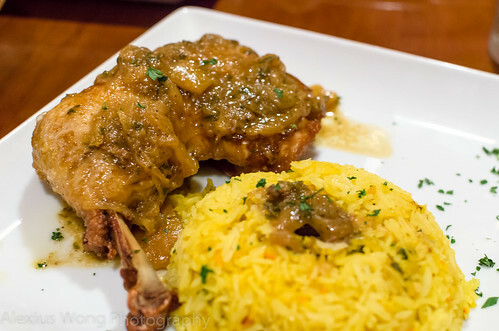 My lamb rice dish was an excellent choice with the tender meat and the wonderfully fragrant savory rice. Even though the dessert was a bit of a let down, I’m curious to discover the rest of their sweet fare on future trips. 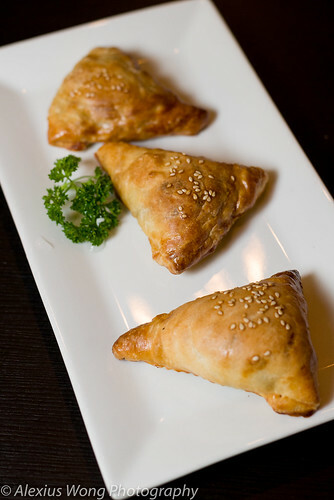 It is about time I found a Middle Eastern restaurant worth mentioning, and Jerusalem Restaurant is worth the hike. 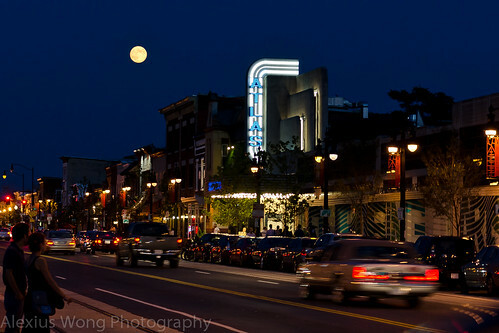 On a late-summer Friday night lit by a radiant blue moon (it literally was), we decided to venture to the H street NE neighborhood to savor the cooking of a new restaurant. It had been many moons (pun intended) since I ventured to this part of town ever since an old friend lived there in the early 90’s. Strolling down its main drag with the full moon getting everyone’s attention and spurring us to enjoy a warm night during the lingering remnants of summer, I was quite taken aback by the area’s development and growth including the influx of diversity in a historically black neighborhood that was enjoying the burgeoning businesses on the strip. 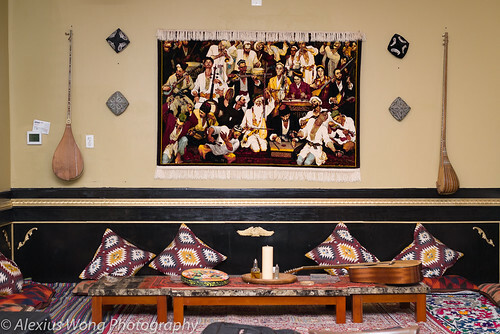 One such place is Souk Moroccan Restaurant. When we arrived at our destination, the restaurant was undergoing some renovations in the main dining room, making its foyer cramped with filled tables. We were invited by the waiters to spend our waiting time at a Hookah Bar a couple of doors away. When the table became available, we squeezed into our table and quickly perused the menu. The offerings are the familiar and traditional Moroccan dishes that I have encountered in other eateries. 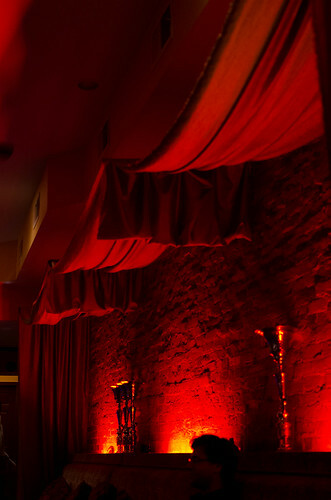 The menu is divided into Cold Tapas, Hot Tapas, Signature Moroccan Specialties, Salads, and Entrées. Our first choice to start the meal off was a combination of cold tapas listed under the Entrée section – Vegetarian Platter. 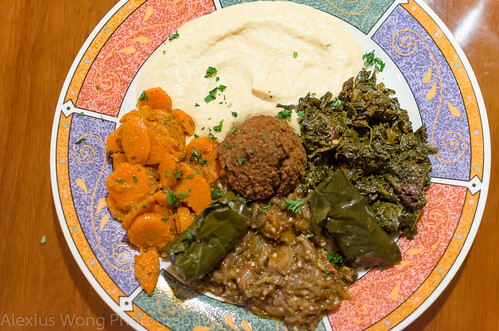 The dish arrived filled with a combination of Zaalouk, stuffed grape leaves, hummus, traditional Moroccan spinach, and carrot salad. The Zaalouk consisted of roasted eggplant, garlic and tomatoes that enticed us with its savoriness, well-balanced flavors, and silky smooth texture along with a good hit of smokiness, and the accompanying pita slices made the perfect scooping vehicle for the dip. The carrots slices were still sweet and perfectly cooked with a tinge of lemon acidity. I could not get enough of the stuffed grape leaves that tasted fresh and not too acidic like in other places. 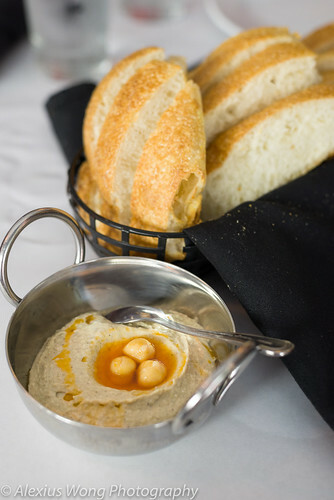 The hummus was not too dense, smooth, and rich with a hint of garlic and tahini sauce. The center of the plate was occupied by a large chickpea falafel that was well-seasoned, light, and crispy from the frying. And the spinach was really tasty with a slight hint of fragrant dried spices, perhaps cumin. I would suggest to order this dish as the perfect starter even though it is listed under the entrée section. As a vegetarian offering, it makes a perfect meatless dish as well. A favorite among the traditional Moroccan dishes is Chicken with Preserved Lemons, and we decided to order this restaurant’s rendition. The dish arrived with a thigh and drumstick that has been cooked with caramelized onions, saffron, ginger, cinnamon, and preserved lemons. The sauce was very tasty but it lacked the preserved lemon flavor that I was looking forward to in this dish. The chicken could have done with longer time on the stove/tagine for it was not quite fall-off-the-bone yet. However, the side of saffron rice blew us away. It was light, very savory, and heady from the saffron threads that added a beautiful yellow tinge as well as its slight flowery fragrance. This side indeed transported us to the sunny fields of North Africa with its wonderful flavors and perfume. Our next choice was Apricot Lamb Tagine. 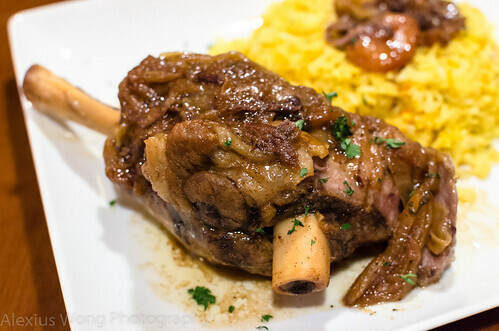 A lamb shank was marinated overnight with a saffron, ginger and cinnamon sauce, and slow-cooked with a few dried apricots. When it arrived at our table, the meat was moist and literally fork tender, indicating its lengthy cooking on a low heat in a tagine earthen pot. The sauce was complex and very tasty, with a hint of sweetness from the softened apricots. While I was tasting the dish, I detected a certain je ne se quoi as the backnote in the sauce. 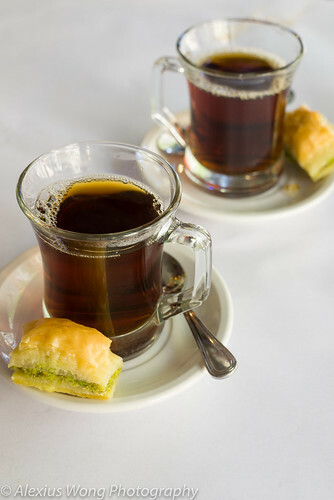 After some mulling over it, I honed on Orange Blossom Water that I have tasted in Middle Eastern pastry. Upon checking this with the kitchen, my guesswork was confirmed – what a brilliant addition to this flavor profile! This dish was not only tasty but it also evoked a exoticness that woke up a sense of culinary wanderlust. Truly memorable. We wanted to try the place’s version of a traditional favorite – Chicken Bastilla. 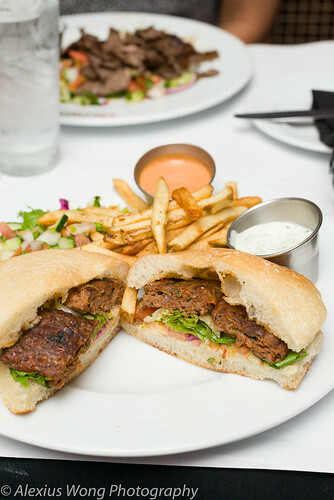 However, the kitchen was out of it and we resorted to the Grilled Kafta. Two kebabs arrived on our table which were made from ground beef. It was well-seasoned with a strong hint of chili and other dry fragrant spices. 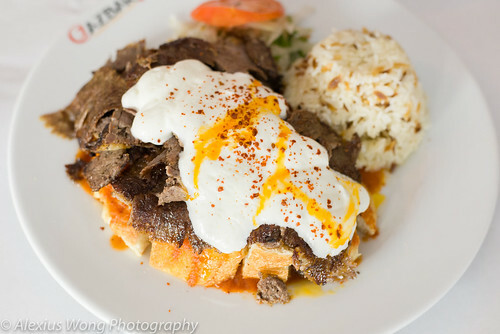 The pool of light tomato sauce provided a slightly sweet and acidic flavor to these pieces of grilled beef – I felt that the other Tzatziki sauce did not contribute much to the dish which remained mostly untouched. 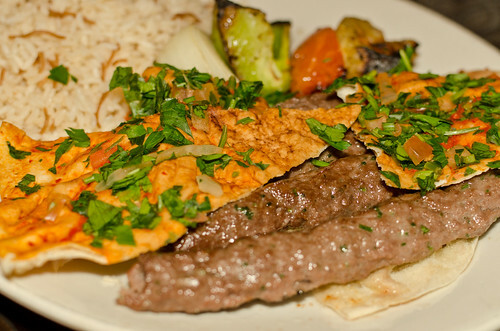 The slices of grilled vegetables had the same smoky notes as the Kaftas themselves after having spent the same amount of time as its meat partner on the hot grill. A mound of that saffron rice rounded off the dish which we continuously could not get enough of. 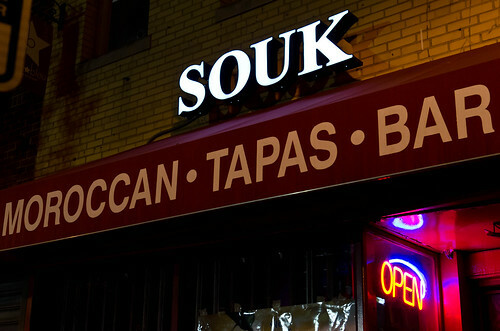 Souk has a fairly short menu filled with traditional Moroccan dishes and a smattering of other Mediterranean dishes. 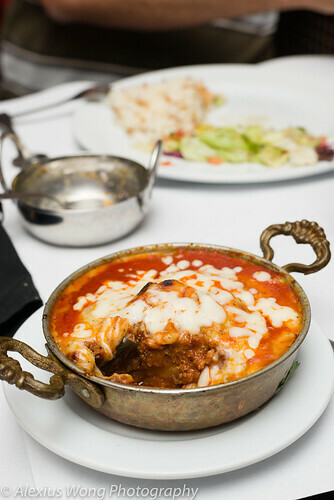 The dishes that we savored were cooked with care and a deft hand that understands flavors of this North African cuisine. 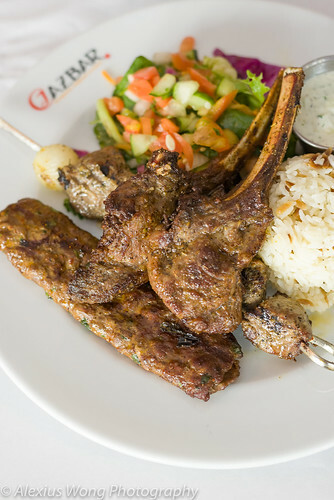 The highlights worth tasting are the cold dishes in the Vegetarian Platter, that wonderful tender and savory lamb shank, the spicy and smoky grilled beef kafta, and the fluffy saffron rice that titillated the senses. 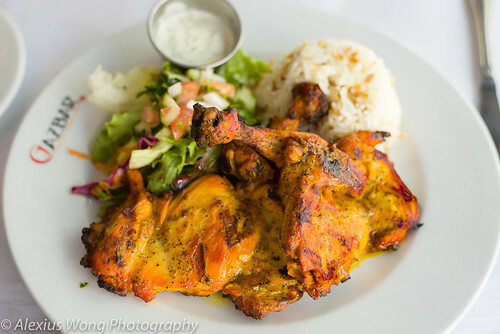 With such wonderful cooking, you may be tempted to complete this meal with a visit to Sahra Lounge a couple of doors down to smoke a hookah as dessert since both locales are run by the same owner. 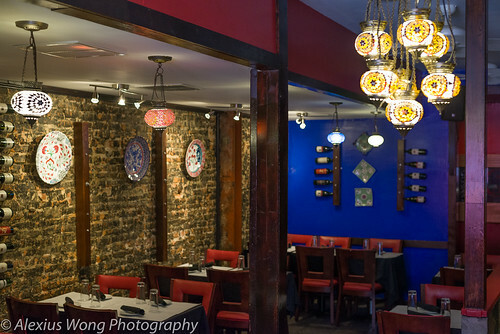 Morocco meets H Street NE – who would have thought of that! One of my favorite things to do when I would visit my twin brother in Dearborn, near Detroit, was to pop into the many Lebanese eateries that heavily dot and pretty much revitalized the westside of Motown, abandoned after the race riots of the 60’s. 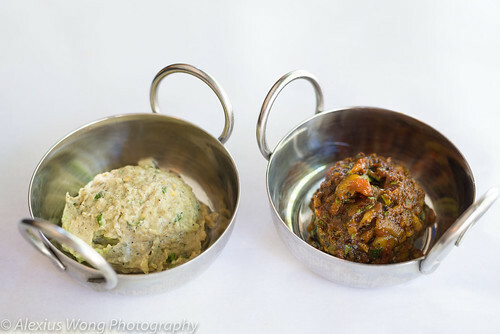 I would savour for the first time the interesting dishes that revealed a new world of spices and unique flavor profiles. Back in Washington DC, I would be invited by a good friend who is Lebanese-Armenian, and his mother would treat me to her wonderful home-cooking – an array of dishes consisting of cheese rolls, Fatoush (vegetable salad with crispy pita), Hummus, Kebbeh (cracked wheat and beef meatballs), stewed meat-stuffed zucchini, and many more wonderful flavorful dishes. 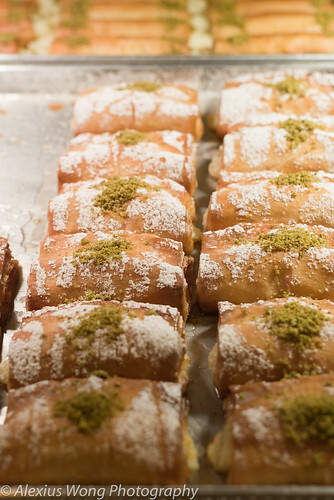 The evening was usually capped off with a tray of imported assorted pastries (smaller portions and less sweet than the Arab-American versions) after having just spent long hours in his suitcase on the way back from a recent visit to his beloved homeland. I must admit that I have not ventured into many Lebanese restaurants in the area since I have been spoiled by my friend’s mother’s cooking and the lack of their presence in the city. But when the opportunity to try out a new restaurant just south of Dupont Circle came up, and while I am currently on my Middle Eastern food kick (see blogs on Mediterranean Kabob and Marrakesh P Street), I hauled along my fore mentioned friend as the connoisseur, and another companion to the eatery on a Friday night. 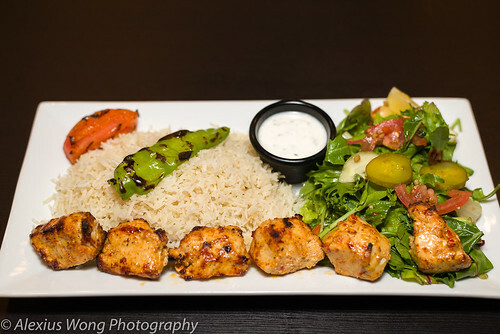 Upon entering Kababji Grill, you sense its modern feel from the slick-looking kabob bar near the entrance to the swanky dining area hightlighted by a uplit minimalistic mural as the focal point. My friend immediately recognized the decor and the brand name – he quipped that he had visited their other branches in Lebanon, Kuwait, and Cairo. Perusing the menu, we were excited to try out some familiar dishes and some I had not heard of. 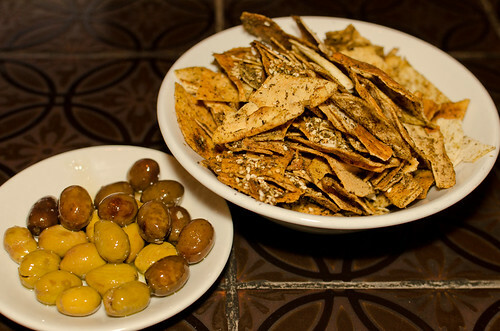 While deciding on the dishes, we received the complementary spiced baked pita bread and cured olives. The crispy bread was brittle and greaseless from the baking, while it was spiced by Zataar (a fragrant powder with dark smokey notes) and nutty toasted sesame seeds. The pieces were irresistible and we managed to polish them off quite quickly, partly due to the tasty seasoning. The cured olives were quite meaty and fruity with a touch of salinity but really nothing extraordinary. We decided to order a variety of Mezzas, or small dishes, to start the meal off. The first was the obiquitous Hummus. However, this order came with minced beef that has been mildly seasoned with exotic spices. The different elements had contrasting textures and flavors that were brought together by a healthy drizzle of fruity olive oil. I enjoyed this flavor combination while a side of soft pita bread made the perfect vehicle to scoop up the chickpea puree. However, I would have appreciated a bit more lemon juice in the hummus in order to provide more acidity to the rather mild concoction. 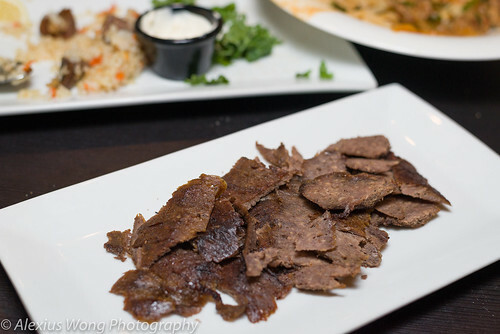 The next appetizer was something that I had never tasted before – Kebbeh Latkin. It is a baked pumpkin and cracked wheat crust sandwiching a stuffing consisting of cooked Swiss chard, chickpea, sumac and onion. The crispy crust was slightly sweet from the bits of pumpkin, and the stuffing was very savoury with the different vegetable elements and slightly sour sumac spice. All three diners enjoyed the different textures and flavors in this unique scrumptious bite. The side of cucumber yogurt provided the rich cooling element to the warm pie. The third small-bite was an order of Arayes. 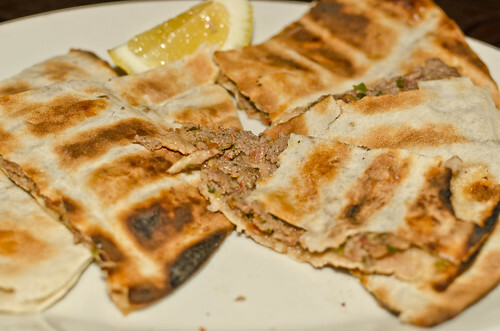 It is pocket pita that has been stuffed with ground beef, parsley, fresh tomato sauce, hot pepper paste, pine nuts, and the house seasoning. A short stay on a charcoal grill was evident by the charred marks on the bread. The filling was flavor-packed from the different elements, and the grill flavor on the pita added another note to the tasty profile. We were getting quite full from the different Mezzas that made a good opener to the meal. For our entrées, we decided to try a couple of dishes. The first was the day’s special. 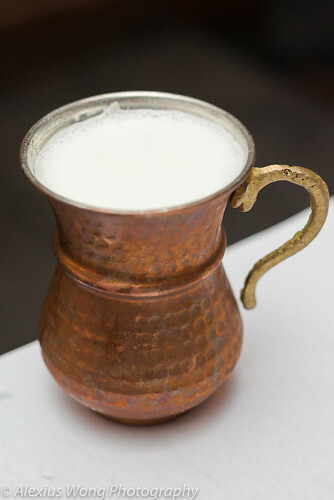 The restaurant offers a daily special everyday, and that day’s was Milokeyeh. 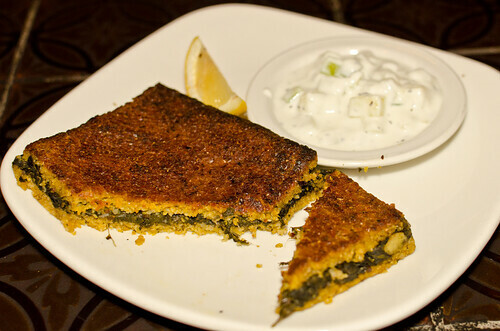 When my Lebanese friend noticed it on the menu, he was thrilled by its presence and recommended that we ordered it. 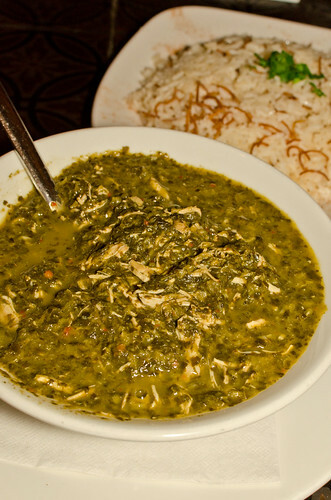 It is a stew made with Milokeyeh leaves (akin to spinach), chicken, rice, garlic, and cilantro with a fairly robust citrus lemon hit. I must say that this dish had a unique and exotic flavor yet I found it savory and quite irresistible, and which my friend was lapping up with gusto. The side of buttery Rice Pilaf made with toasted vermicelli and topped with a sprinkling of cinnamon powder was the perfect accompaniment to the stew. 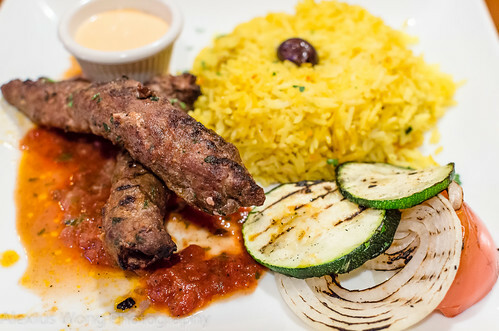 For the last main course, we decided to go with the familiar – Kafta Kabob. It is basically grilled seasoned ground beef kebab. It was served with some grilled onions, green pepper, and eggplant, along with that aromatic cinnamon-laced Rice Pilaf. It was well-made and decent, but not as tasty and seasoned as those we have tried in other Middle-Eastern eateries – my friend commented that Lebanese kabobs are less seasoned than other renditions. Slices of pita bread slathered with a spicy paste made a good tasty wrap around the grilled beef. 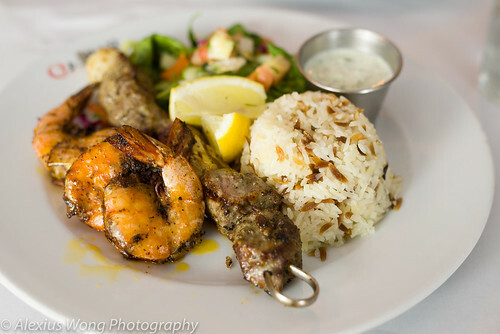 Kababji Grill offers good and tasty authentic Lebanese cuisine, from the familiar dishes like Kabob and Hummus to the more unknown dishes like the day’s special of Milokeyeh stew and the pumpkin-cracked wheat-Swiss chard pie. Such a wide offering is not common in most Lebanese restaurants, especially in a downtown location. It is a pity that we had no room left for the pastry desserts that are customarily enjoyed at the end of a meal, and I could not review on their sweet offerings. But the dishes that we tasted there were very flavorful and satisfying, good enough for me to want to pay it another visit in the future – I am sure my Lebanese friend would love to tag along the next time.